In this second post in a series on Credibility I share how my Credibility has been gained [and supposedly lost], giving examples of public perception in the investigations I have carried out in the last year. It’s only a ‘black and white game’ to genuine truth-seekers as most interested parties to a given subject have an agenda and this influences their words, thoughts and actions. I’ve undertaken several investigations in the last year or so. In all of them my credibility has grown in some corners and been questioned in others. In fact it’s actually got to becoming a mark of honour for me to have my credibility questioned, for it always seems to indicate yet another ‘direct hit’! To my way of thinking, only fools, those with agendas and those with things to hide seem to want to attack my credibility. I nailed the Ormita fraud with quite a considerable potential personal cost in terms of credibility. With a history of highly public vicious personal attacks on others in the industry; clever name-changes and ultra-sneaky personal and business maneuverings Daniel Evans was a real force to be reckoned with. One of the reasons that his fraud continued so long was that others couldn’t and didn’t want to properly engage. Once the conman knew what I was up to and how serious it was becoming for him (he had ignored my initial approaches) he lashed out with several credibility attacks, one claiming that I was his jilted ex-homosexual lover; another that I was going into competition with him and so on. I addressed these as best I could and carried on. Ormita is no more and the conman is in hiding. The point though is that the people that matter to me know exactly what the score is. I’m straight and was prepared to pay the price for doing what I did. The other guy isn’t and wouldn’t. Ormita is gone and it’s game over. Bartercard lashed out in defence threatening blue murder for my blogging and expose of their dishonesty. It was all hot air unfortunately (for I would have loved to square off in court with them and increase the exposure of their corrupt Ponzi scheme that they call a barter exchange). I responded in detail to an incredibly stupid piece of spin from their CEO Trevor Dietz that I’m sure he’s regretting having put out to the industry in retrospect. Ad hominem attacks included, I consider it a privilege to having to spar with such a fool of a high profile Director of a publicly listed company. In some circles my name is no doubt hated, perhaps even feared, but I can tell you that even now, I have people telling me that I got it all dead right. That’s the sort of credibility that I have from having done the work, then having the balls to actually put it out there. It also makes me feel pretty damn good too! When I stumbled onto the secret deal that Bartercard and IRTA had stitched up under the IRTA Members’ noses for an exclusive endorsement of their yet-to-be-released ‘Webturtle’ software (as the best in the industry for the next goodness knows how many years), I set off a chain of events that turned into a real nightmare for both Bartercard AND the IRTA Executive. You see they screwed up with the whole thing and both parties had to panic in response – Bartercard had gone out all guns blazing with their dodgy prospectus selling their deal as a coup and the basis for their entire IPO whereas IRTA’s Board had given the Executive Director the approval to go out and do something but the Board (except the ones in on it) were kept totally in the dark. Their emergency Board Meeting fudged the matters through and a hurried Media Release full of BS supposedly saved the day and kept the Titanic afloat for a bit, but the damage had been done. This was a serious credibility blow for the IRTA Executive who most likely had a very poor turnout at their Cancun Conference as a direct result of my hard-hitting blogs. In my books, that’s real credibility – divisive perhaps, but real. When I started diving into the Universal Currency figures we all (IRTA and I) got into some serious credibility issues. I was working with actual UC data visible to UC Members in real-time. The IRTA Executive on the other hand were denying and obfuscating and still are. Real credibility comes from looking at the facts. Spin from those in power, especially when it is in their personal interest to cover things up will always be spin. When the GETS Summary Report gets out into the light of day, even the people who don’t want to believe that their sister, friend, colleague or whoever has been covering things up will have no choice but to acknowledge that, OK Dennis got it right. Credibility may never come from all quarters but the truth is never in a hurry and it will always ‘out’. 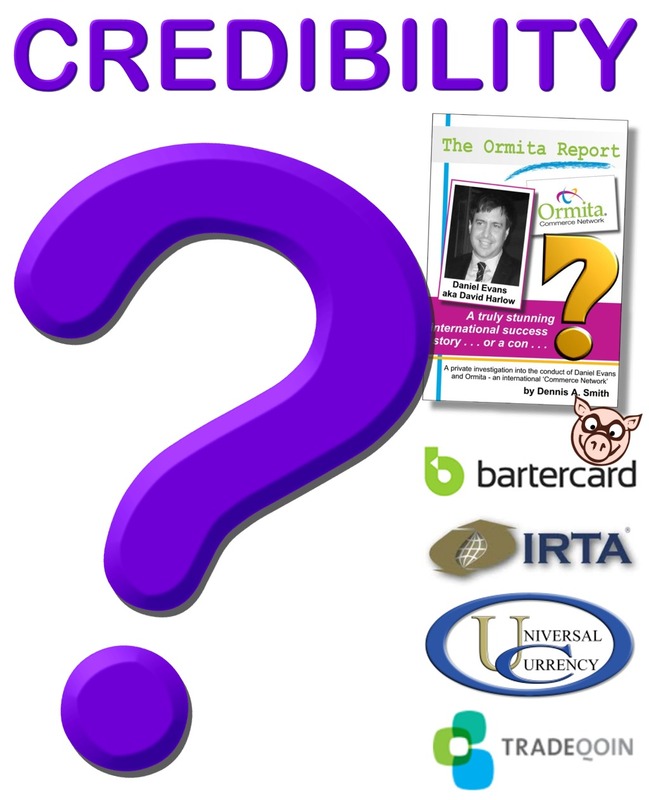 Lastly as I have mentioned a couple of times, the Tradeqoin crowdfunding scam brought about a hilarious swipe from the Executive Director of IRTA, Ron Whitney who informed an enquirer that according to “IRTA and UC”, I lacked credibility and in particular over the TradeQoin blogs! That TradeQoin has had to adjust their entire business plans and budgets and crowdfunding targets and sales figures and entire valuation as a result of my blogging puts Ron and IRTA’s opinions into proper context. The ED who spouted this nonsense that “Dennis is not credible” is now clearly seen as just a small man in a powerful position looking after one of their own! As I have shown many times, IRTA’s credibility starts and finishes with their own interest and the next political problem to deal with from will be dealt with in the same manner, “He’s not credible!” except of course when it suited them to talk me and The Ormita Report up as the best thing the industry has had in a long time! The parroted party-line from the IRTA lot was exemplified by Rob van Hilten’s endorsement of IRTA’s defence in the face of my blogging. As I was sharing actual facts from UC member-visible data Rob spouted support for the same story. In doing so he invoked litigation for defamation and showed his true colours in public – essentially, “IRTA, IRTA, IRTA and facts be damned”. Finding out quite some time later that his own house was a pack of cards was a major blow to his credibility and put his insistence on the IRTA viewpoint that there was/is nothing wrong with Universal Currency into context to the thinkers in the industry. One industry professional put it this way when I broke the story, “Oh no! Not Qoin too?” Qoin’s credibility is in tatters, now, with the self-proclaimed experts shown to be talkers, highly capable of gaining funding from the public purse, but incapable of putting together a functioning trade exchange in practice, instead simply “faking it until they make it”. They can talk until the cows come home from here-on-in, but now that it’s all out in the open, their credibility will be constantly questioned, which is to me, a very healthy state of affairs. They can rebuild their credibility of course but that’s a hard road when your back is against the wall and you’re still on the downwards slide. Credibility is undermined by vested interests and especially when those interests are concealed. I always declare my personal interests up front – always – and this develops my credibility. Not receiving income from the people who have gotten benefit from my work also builds credibility. It was kinda funny when a relative of a key player at IRTA claimed (twice, once in his own name and another time with a pseudonym) that I was getting paid to blog against IRTA et al! Totally wrong, and wrong with a capital “R” too! When IRTA supported my exposure of the conman Daniel Evans, I was “highly credible”. The instant I started looking into their own conduct though, and commenting on one of their Board Members’ shonky business dealings (Tradeqoin), to the ‘good folk at IRTA’, I was no longer credible. Such is the fickleness of those with an agenda. Their own credibility is seen for what it genuinely is – zilch. You can’t win credibility with all people all the time. Tell me about it! In my next post in this series I talk about the challenge of building credibility in Samoa, a country that I’ve recently adopted as my home, and a serious challenge to anyone with a white skin wanting to gain credibility.